Apple have finally unveiled the iPad. It has a 9.7 inch capacitive touchscreen, runs a 1GHz chip, has a 10 hour battery life, is half an inch thick and weighs just 1.5 pounds. You'll be able to buy 16GB, 32GB or 64GB sizes. Apple has finally unveiled the iPad. It has a 9.7 inch capacitive touchscreen, runs a 1GHz chip, has a 10 hour battery life, is half an inch thick and weighs just 1.5 pounds. You'll be able to buy 16GB, 32GB or 64GB sizes. It'll be able to run iPhone apps but has custom-made apps specifically for the iPad. As of today developers will be able to develop apps on the updated iPhone OS SDK from today. The built-in iPad apps, iPhoto and iTunes, are more like Mac programs than iPhone apps. It has a large touchscreen keyboard and the interface is very similar to the iPhone which is something many will be happy with. It's also got some built-in location services that lets the Map app auto-locate, and the iTunes store is built-in for previewing and buying media. The iPad can run iPhone apps but you can also zoom in on the apps to make them appear full screen. 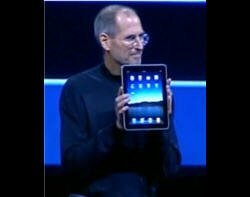 Steve Jobs says that the user experience of browsing online with the iPad is far better than on an iPhone or a Mac as it has a large touchscreen that you can manipulate.